Ever felt like driving from one end of the country to the other? One of the longest running racing game franchises brings this experience to you in their latest Need for Speed game, THE RUN. Developed by EA Blackbox, The game has received all the hype that it needed but sadly, YES sadly it doesn’t deliver as expected. In the game you play Jack. Lord knows why, he finds himself entangled with the mob, and has to pay them off. He almost gets himself killed in a car crusher in the beginning of the game, but is given a last chance for redemption. A winner takes all, $25 million cross country race across the Unites States, from San Francisco to New York. If you’ve been following the trailers, what you’ll notice is that EA have tried to make the story intense and adventurous but the plot is the killer of the fun. You’ll be twiddling your thumb to skip the scenes and thankfully, the cut scenes are small. The entire race course across the United States in divided into 10 stages. Each needs you to complete several races. Apart from the long coast to coast rally to get to the top 100 racers, you will need to complete checkpoint races, time trials and battle races where you have to keep the lead for a fixed amount of time before you can move on to the next opponent. 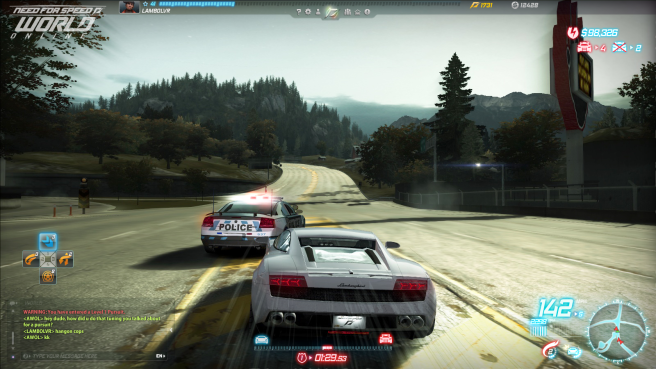 I’m a big fan of the Most Wanted pursuits and since then I felt pursuits have went downhill in NFS games. The cop chases are a little disappointing compared to previous installments. They never intensify to the level of spike strips and EMP blasts but you encounter some high voltage chase sequences with the mob where you are constantly evading gunfire from helicopters and SUV’s. The entire race time boils down to around 2hours 30 minutes which doesn’t include the mob chase sequences or the cut scenes. 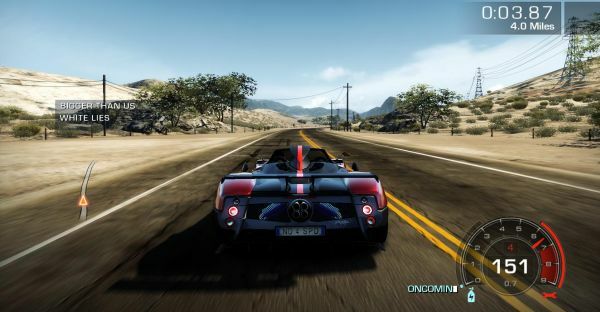 The game delivers over 120 cars, most of them variants of the same car as you don’t get to customize your ride. You still don’t find the Ferrari here and certain cars are specific to platforms like the Veyron, which is available only for the Playstation. But PC Gamers still get to ride the Lambi Aventador. Autolog lets you keep track of your time and your position with respect to your opponents via the Speedwall for multiplayer mode. Every race, be it in the single player or multiplayer contains certain objectives. You get to earn XP in every race by passing opponents, getting airtime and completing objectives, which you could complete for rewards like rare cars, emblems and other stuff. The graphics of the game are its savior. Thanks to the Frostbite II engine, you drive through some amazing landscapes. Be it the country side farm lands, snowy mountain passes, the Chicago skyscrapers or the Nevada highways. The experience is stunningly amazing. Up close though, grainy details of character modeling cannot be ignored. NFS games usually leave you humming their soundtracks long after you’re done playing the game. There’s a lot of rock and roll unlike the usual hip hop and electronica in this edition. But nothing beats the sound of the Gallardo roaring down the Las Vegas strip. Need for Speed-The Run : How far will it run? This game can get very annoying. Several pauses during game play for the weak storyline, retries if your car crashes can test your nerves. Some races need you to start all over again if you drift off the road even by a little bit. Not to forget the times when you get totaled. Initially it’s nice to see your car parachute into the air with a symphony of metal and sparks blazing but I thought the game overdid it. The game has a weird way of letting you change your ride. Every time you want to do so, you need to drive through a gas station where you can select a different vehicle but at the cost of valuable race time. If you want to improve your time you have to repeat an entire stage as you can’t redo a specific event and furthermore you can’t skip the cut scenes. Not even the one in which Jack stares at the girls’ booties at a gas station. The story has nothing creative and new. You don’t feel for the character you play. A good beginning makes a good ending. But the beginning is so vague and you won’t even know that you’re done with the game until you notice the credits start rolling. . If you’re looking to just fill your NFS game collection, you’ll need to pick this up otherwise this one has no replay value. If I had to rate this game on a scale of 10, I give it not more than 7. Wow! Eager to play this Game. I agree the storyline is weak. 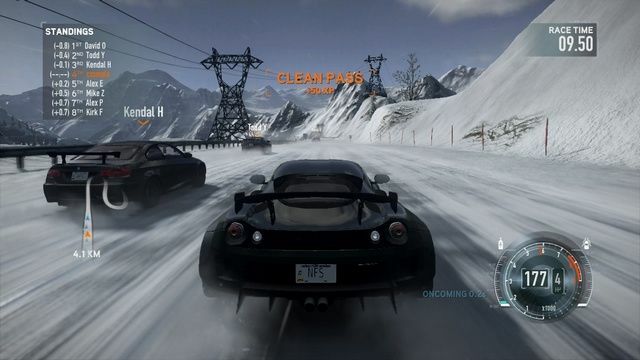 But the gameplay of The Run is different with previous NFS games. It is actually thrilling when racing through the hills and snows. I replay this game a year later. Not as exciting as first time. ‘Some races need you to start all over again if you drift off the road even by a little bit’ is damn true. Like the porsche for handling, like the aventador for feeling.